During my India trip in August this year (2013), i had the good fortune of visiting the residence of Sai Sandhya in Trivandrum. Sai Sandhya is a young celibate who has dedicated her life to the worship of Lord Sathya Sai Baba. Swami blesses her with numerous visions and dreams which are mostly instructions for her to do particular tasks associated with her worship. 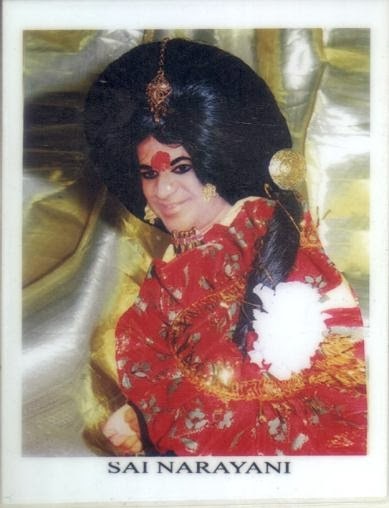 At her residence, Swami is worshiped in the "Sai Narayani" (Devi or Goddess) form according to Swami's own instructions. Swami Himself had physically blessed and approved the worship of this form. Sai Sandhya has surrendered totally at the Lotus Feet of Bhagawan and has immersed herself in the Upasana (worship) of Sai Narayani. When Swami left His body on April 24, 2011, He told Sai Sandhya in a dream that it was all a maya and that He would be back in the Sathya Sai form once again. Since then she started announcing to everyone around her and the various visitors to her home about the imminent reappearance of Bhagawan. Many of the devotees who heard this, scoffed at her and even termed it as a crazy idea. Despite of all the criticism, she has stuck to her faith of His return, which Bhagawan Himself had instilled in her by the virtue of various visions and dreams. Later on, when she received a copy of STKC (Sai, Thy Kingdom Come) from a friend, she was overjoyed to see the same belief echoed in the book. It was around that time i came in touch with Sai Sandhya through another devotee (Malathi Lakshman) and during my recent India trip, made it a point to pay her a visit. Our conversation started off on an exhilarating note. Out of the blue, Sai Sandhya threw me a question “Is your nakshatra (2) (birth star) ‘bharani’?” I replied in the affirmative. As i stood there wondering how she could have known, in a flash came her answer: “Swami mentioned to me in a dream yesterday…and did you know that today is bharani too?”. The day of the bharani nakshatra (star) is considered very auspicious for the Goddess worship and i felt it was not just a coincidence that i was visiting the Sanctum Sanctorum of Sai Narayani right on that auspicious day, which also coincided with my birth star! Then our conversation moved to the topic of Swami’s return. Sai Sandhya narrated many incredible things that happened in conjunction with His return. Much before STKC was published, she had a vision in which an ultra brilliant light like that of a thousand Suns appeared in the sky heralding Bhagawan's return. On the clouds in big letters was written "Thy Kingdom Come". 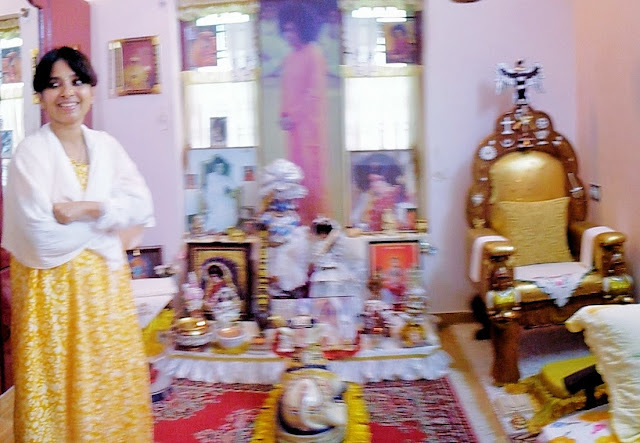 Following that vision, she had a Divine Inspiration to place on top of her altar, a picture of Bhagawan that she received quite mysteriously from a Saintly person, along with two figurines of angels on either side. All this happened on the Christmas day of 2011, i.e., three months before STKC was published. Much later when she received a copy of STKC, she was stunned! For one thing, she had already seen the name of the book in the vision. 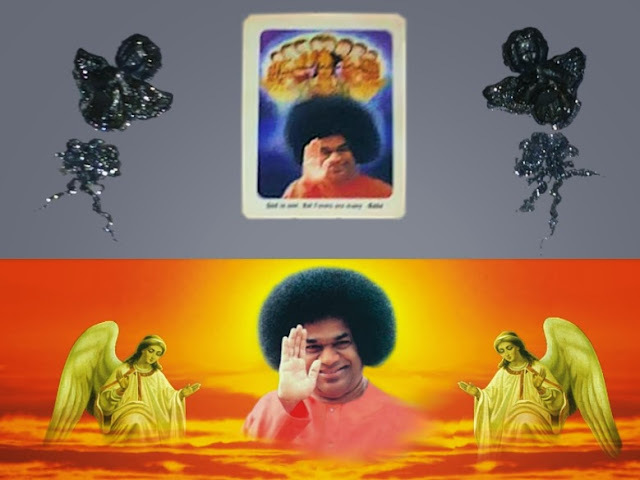 Secondly, the exact same picture of Bhagawan that she had placed on the top of her Altar along with the two angels, were depicted on the cover page of STKC. Too much for a coincidence! Sai Sandhya showed me many pictures from her album as proof of the various miracles that had happened with her and in the house. In the center picture of her Altar, Swami is seen holding His palms together. However, when a photo was taken of the Altar, Swami was seen clearly in His blessing hand (Abhayahasta) posture in the same center picture. I can go on and on…but only seeing is believing! After paying my most reverential salutations to Sai Narayani, i departed with a heart full of Divine bliss and beaming with joy at Sai Sandhya’s assertion that Swami would be returning soon! (1) Bindi - A decorative mark worn in the middle of the forehead by Indian women. (2) Nakshatra - The term for lunar mansion in Indian astrology. The zodiac is divided into 27 Nakshatras through which the Moon has to pass through. Bharani is the name of the second Nakshatra. Beautiful story here! Thank you. Happy Birthday, dear Swami! Thanks for giving us this gift today! Very happy! On 8/8/13, I had a beautiful vision. It was cloudy and raining. I was standing at the edge of a cliff top. Against a sky of radiant golden light, Swami was descending from the sky towards me with a halo of light which surpassed the brilliance of thousand suns, holding his yellow robe with one hand. Significantly a portal has opened up in the process of the evolution giving all souls who are ready to connect with the Divine. YES! Swami's return is a CERTINITY rather than a possibility. Another day, I was meditating with a crystal in hand. Suddenly, I saw Swami in his WHITE robe bending down and I felt HIS SACRED TOUCH on my hand and also clearly heard HIM say "I am always with you". I opened my eyes and it was 2:20AM. All I asked as I started to meditate was, MY BELOVED LORD'S DARSHAN. THANK YOU SWAMI. I join SreeJith Narayan and all the rest, in earnest prayer and devotion, awaiting our beloved Swami's MANIFESTATION. Please Swami, bless us all to live a life, to reach a level of consciousness so that we children do not miss your most loving sacred Dharsan on your return as Sathya Sai. YOUR WORD IS TRUTH. IT NEVER EVER FAILS. SaiRam All, I deamt of Swami some months ago. He was speaking in a language that I could not understand. I told him that I only knew English (although I was thinking that I did not even know English ) but he continued to speak in this strange language. Then I told him that I did not understand what he was saying, Swami started to speak in Hindi, again I said I only knew English after which Swami started to speak in English. Swami was smiling and very happy in the dream... soon after I woke up , I felt a strong energy entered into my head and I heard the words ...I will come back soon.... I immediately remembered only two words in the dream which were....phir ayenge...an East Indian then came at our home and i asked her what it meant, I was shocked when she said ...I will come again...I also googled and got very emotional when I read ..Sai Thy Kingdom Come....Sairam. This is such a beautiful and inspiring story. awaiting anxiously toget the dharshan of swami.thank you srijith. Could you please give me the contact address of Sai Sandhya? Yes, these kind of strange coincidences baffles us even the devotees. I first met Bagawan on 25/12/1964 Christmas day at Abbotsbury Chennai. Strangely on 24/12/1964, i was weeping all through the night looking at the photo of Bagawan, since my uncle told me that he will take me to Abbotsbury next day along with his daughters. But Bagawan entered my mind long before I saw him physically through a book. Once I was thinking that he was a hoax and such persons should be put behind bar. This was the result of a full page article on Shirdi Baba and Parthi Baba connecting them and stating that our Swami is reincarnation of Shirdi Baba. At that time, I was a fanatic devotee of Shirdi form and I could never digest any information connecting Shirdi baba to any one on earth! Within a few days after reading Sathyam Shivam Sundaram by Sri Kasthuri and the first volume of Sathya Sai speaks, the clouds of doubts in my mind vanished without my knowledge. It is a rare opportunity for me to meet Bagawan in person. Soon I had many Dharsans in Chennai and one day I was standing near a bunglow wherein Swami was residing. the iron gates were closed and locked inside so that none should crowd there. We are all waiting fervently praying for His Dharsan.Suddenly Swami came out, asked the gardner to open the door. I ran inside and stood just very near to Swami and involuntarily I asked him, "When I could come to Parthi".Swami said, "January first week lo randi Bangaru". Come during the first week of January my golden". I went there braving many odds since this is my solo trip without any aid. With great difficulty I reached the precincts of Prasanthi. Somebody guided us to sit in the verandah! Swami came out and ushered us in. It was face to face. He explained everything and assured his Divine Protection. Subsequently also in three more years, I got three more interviews. Swami told me "You have Faith, Be happy". That much is more than enough to pull on for the rest of life. When he left his physical frame, I was praying in front of the shine room. Swami gave me a vision and shown His abhayahastha! Now He is not seen physically but Present subtly everywhere. Let us wait His Will to fructify in His Own Sweet Time! Sairam. so that I can also benefit from the contact with a sincere devotee?